Along with the Sermon on the Mount (Matthew 5-7) and the Upper Room Discourse (John 14-16), the passage you read today is one of the longest “sermons” or “instructions” that Jesus gave. Spoken to His disciples while on the Mount of Olives (24:3), these two chapters are often referred to as the Olivet Discourse. Their subject matter? Jesus responded to an often-asked question about the timing of His return and the end of the age (24:3). As much as we could wish for a specific date on a calendar, Christ’s bottom line answer was that the exact timing is unknowable (24:42-25:13). That is not to say that there will not be some clear warning signs along the way. There will be apostasy and false teaching (24:10, 11). Again, although different in degree, there has been an unending series of people antagonistic to Christ and teaching contrary to His. There will be the “abomination of desolation” (24:15; Dan. 9:27; 2 Thess. 2:3, 4). Midway through the Tribulation, the antichrist will position himself in the restored temple to be worshiped. Jesus says this act should capture the attention of those on the earth. There will be a number of people claiming to be “Christ” or to have seen Him (24:23-28). This is no reason to think that a person has missed out on the event of His return. Interestingly enough, the Mount of Olives not only provided the setting for Christ’s instruction about His return. It was also the location from which He ascended into heaven (Acts 1:9-12). 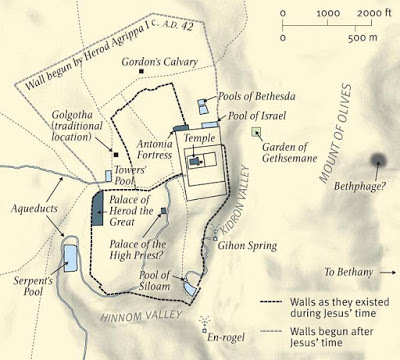 And it will also be the location to which Jesus will initially return at the end of the tribulation (Zech. 14:1-4). But don’t ignore one of the major thrusts of Christ’s teaching that day on the Mount. Are you ready? Are you living life in strategic anticipation of that day? This entry was posted in Matthew, Mountaintops. Bookmark the permalink.